It is officially cherry season up here in the PNW, and I am in ripe, juicy, cherry heavennn. I apologize in advance if the next ten (maybe more?) recipes have cherries in them. I definitely foresee that as a legit possibility. 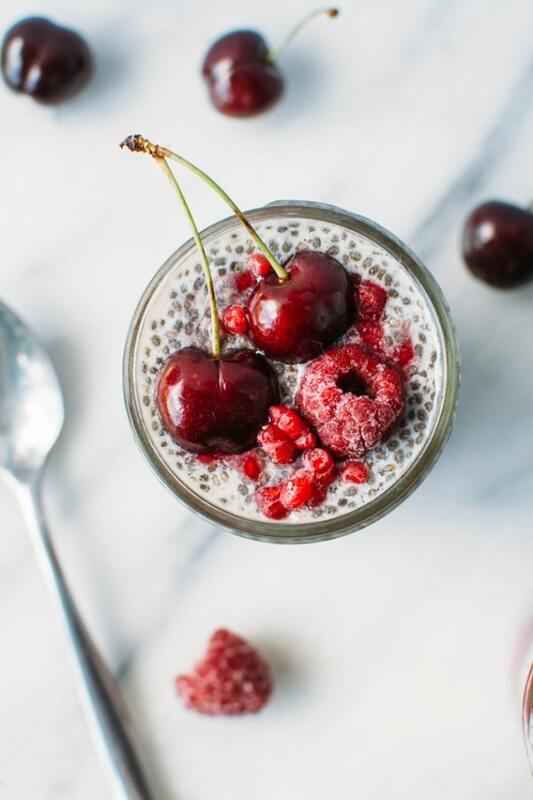 Starting out the cherry parade is this creamy vanilla bean and cherry raspberry smash chia seed pudding! It feels like cherry season came a little bit early this year. They usually hit the market the beginning of June, but tend to be a bit wishful in their state of ripeness and flavor until at least the end of the month, sometimes even the beginning of July. Myself, being the ardent cherry lover that I am, bought up the first decent looking bag of cherries I found on the shelf about a week ago – half expecting them to be a little lackluster in their sweetness and bite, but not caring because – CHERRIES! Surprisingly, I was charmed and delighted by their perfection! These cherries were the archetype of what a cherry should be. Juicy and sweet, with just the right amount mouthwatering of bite. Never mind the $15 price tag that accompanied them. So worth it. (Don’t tell my husband). After eating my fair share, sitting out in the sun on our deck (talk about spring perfection), I set about finding ways to savor them a little bit more – tucking them into various recipe ideas where I knew their scrumptiousness would shine! This chia pudding was the first thing I landed on. 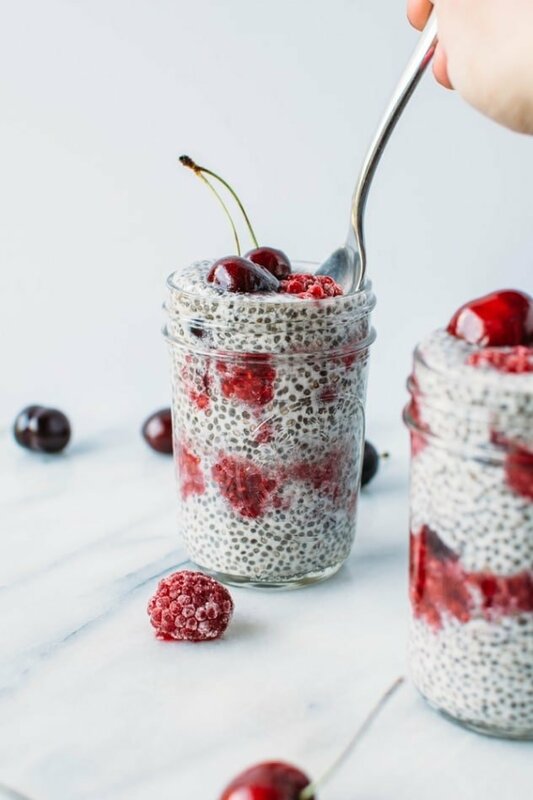 The creamy vanilla bean studded base is layered with sliced cherries and tart, bright smashed raspberries for the perfect quick morning breakfast, mid day treat yo’self snack, or a healthy yet indulgent dessert. It’s pretty much got every good thing going for it. Starting with all the nutrients packed in chia seeds! And the list could literally go on and on.. these little gems are definitely something worth celebrating and including in a healthy, whole foods diet! Some type of liquid – usually milk for a creamy consistency. I love using almond, cashew or coconut milk. Then comes the fun part where you get to pick whatever flavor or direction you wanna take your whole chia seed pudding experience. The possibilities are endlessssss. I mean, check out all these awesome combos. Those all sounds SO good, right?! 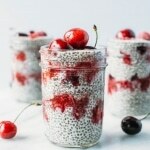 Now you see why my love of chia seed pudding runs so deep. And for as pretty as it is, it really could not be any easier to make! 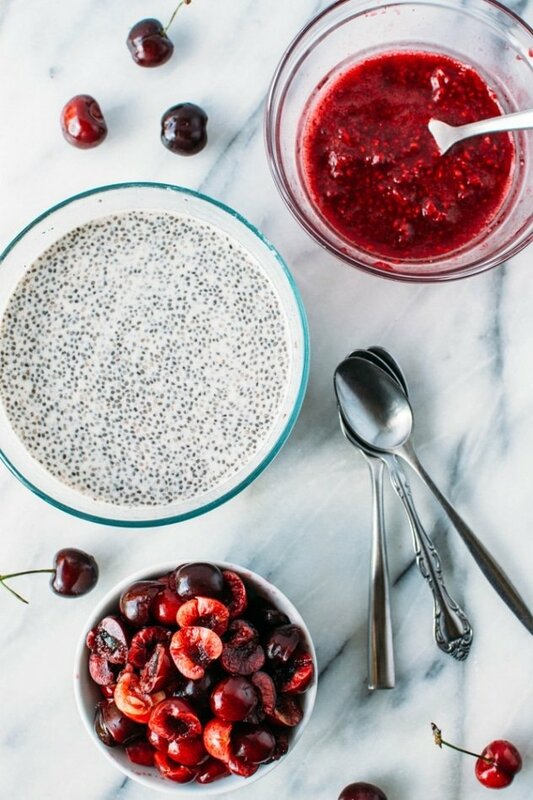 The two hardest parts about this recipe are waiting for the chia pudding to set, and pitting the cherries. Also trying not to eat them all as you do  I decided to make a 50/50 deal with the bowl. Took a little longer but we both felt comfortable with the agreement. 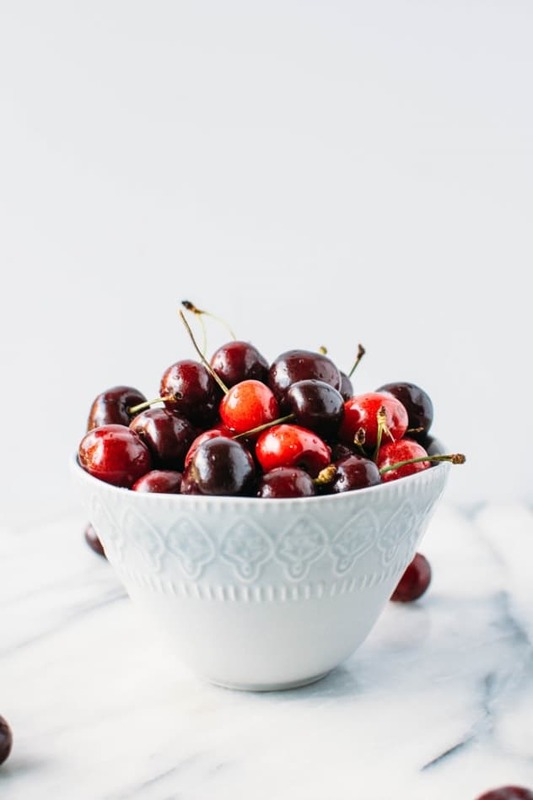 Once the pudding has set – this usually requires at least a few hours, but overnight is best – and you’ve pitted the cherries, you’ll add some raspberries (either fresh or frozen that have been thawed), to a bowl and smash away with a fork until they’re nice and jammy. 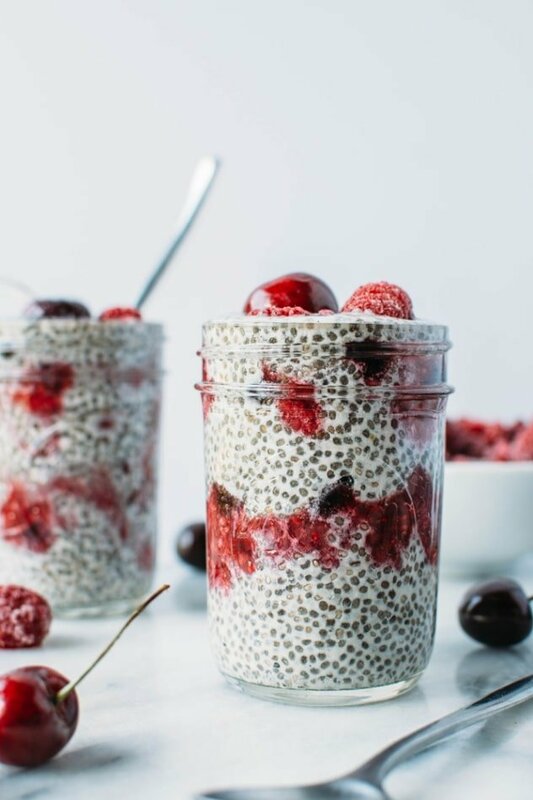 And then layer away to chia seed pudding nirvana. I told you it couldn’t be any easier! The best part is you can make a few of these ahead of time and enjoy a decadent and healthy breakfast all week long with literally zero effort besides unscrewing the lid to a jar. 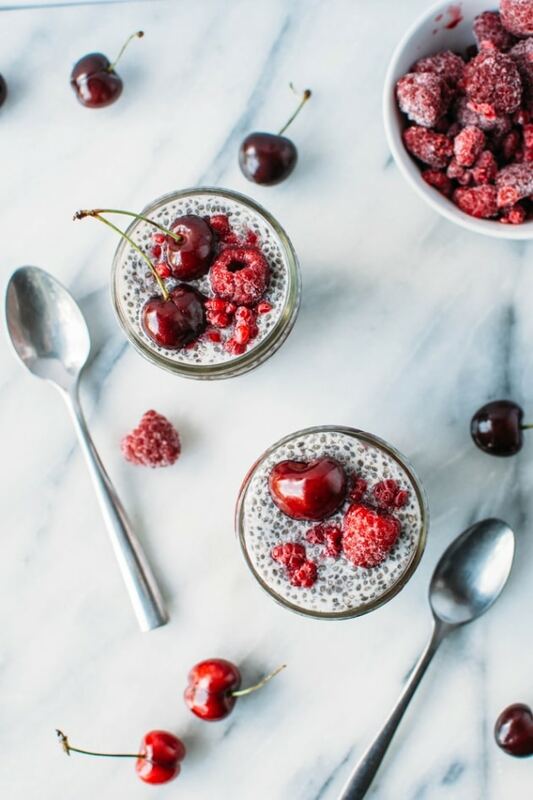 Creamy vanilla bean and cherry raspberry smash chia seed pudding is super easy to make, good for you and perfect for an on the go breakfast, snack or mindful indulgence! If using, scrape contents of vanilla bean into a large bowl. Add about 1/4 cup almond milk and mix together using a fork or the back of a spoon, until the vanilla beans are fully incorporated. Whisk in the rest of the almond milk, vanilla extract, maple syrup and sea salt. Whisk in chia seeds and move bowl to the refrigerator, for at least 4 hours, ideally overnight. Pit cherries and slice in half, leaving a few whole to top the pudding if desired. Set aside a few raspberries to top puddings as well. 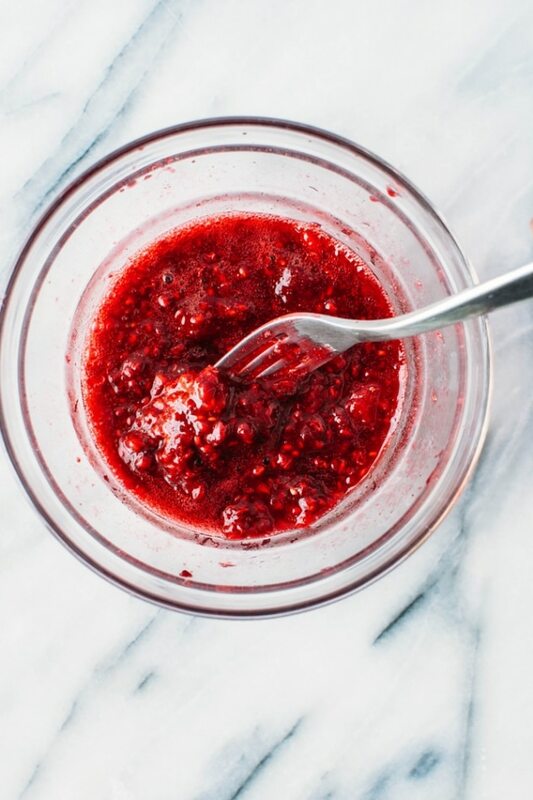 Smash raspberries with lemon juice using a fork until nice and jammy. Layer pudding, cherries, and raspberries in a small 8 oz jar or container. Top with extra berries and cherries and serve or store in the refrigerator until ready to eat! 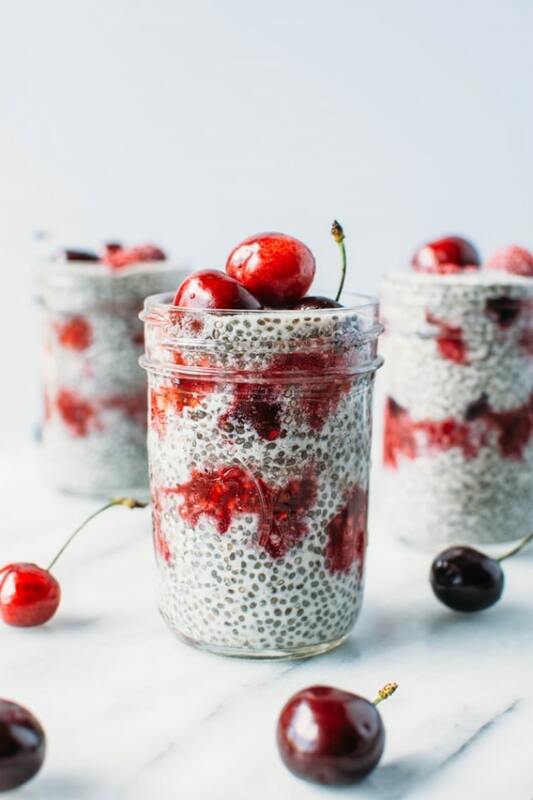 This entry was posted in breakfast, sweets and tagged breakfast, cherries, chia, chia seed pudding, dessert, easy, gluten free, grain free, healthy, nyssa, nyssa's kitchen, paleo, pudding, quick, raspberries, sweet on June 9, 2017 by Nyssa Tanner. I usually have chia seeds in my breakfast smoothie. I never wait enough to get the jelly consistency of a pudding. I’m inspired now, will prepare this in the evening, sleep it over, and start the week with something very pretty and nutritious! Yes Dani! I love it! 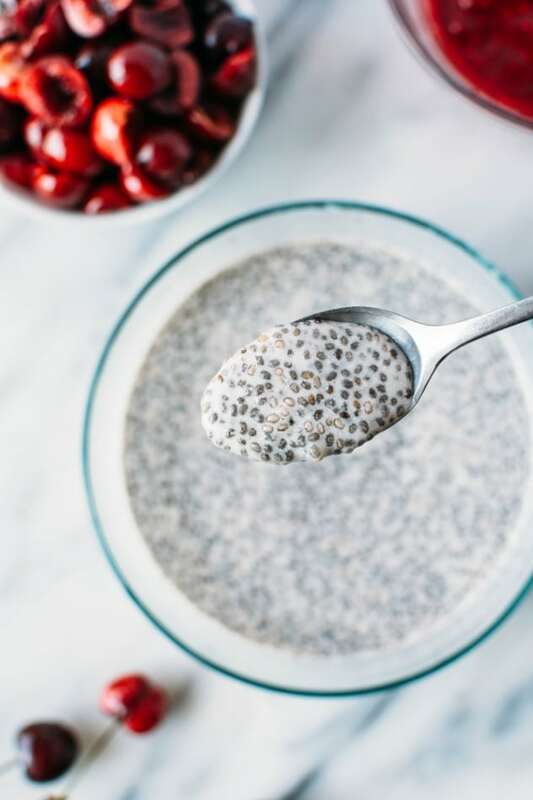 I am the same way sometimes about chia seeds, but I think you’ll love this recipe and find it worth the wait 🙂 Enjoy! !